Data Innovations' products span the breadth of clinical testing for a single work area to multiple disciplines, from one lab to many, from one small work area to the largest laboratories in the world. We deliver efficiency and effectiveness through our Connectivity and ability to integrate all of your instrumentation, automation, information systems and locations. Our Productivity solutions provide improved laboratory effectiveness and use your critical resources more wisely and proficiently. Our Quality solutions integrate with production and automate regulatory activities, reducing time and the complexity required to perform these reoccurring and necessary tasks. Our Management tools offer instant access to timely, actionable performance metrics which provide critical insight for their laboratory operations. 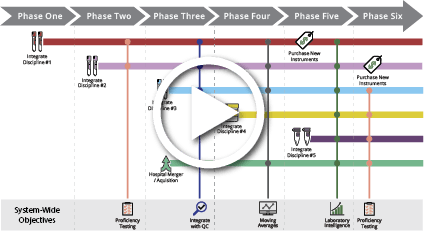 Watch how Instrument Manager can evolutionize your laboratory. Our experienced consultants deliver implementation while our training provides the self-sufficiency and knowledge in order to continue to evolve your system as the environment demands. Equally as important is our experienced and dedicated support staff who take care of your critical operations. Our solutions enable your laboratory to be competitive, cost effective and improve revenue generation. In an ever changing clinical world, Data Innovations has dynamic, flexible, scalable solutions delivering tomorrow’s lab, today.